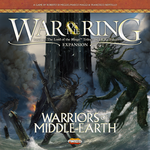 War of the Ring: Warriors of Middle-earth includes Ents, Dead Men of Dunharrow, Great Eagles of the Misty Mountains, Corsairs of Umbar, Wild Hilmen from Dunland, and Giant Spiders, and with this new expansion for War of the Ring (second edition), these warriors and creatures of Middle-earth – previously featured only as special Event Cards – will become an essential part of the game, with unique figures and specific abilities. Warriors of Middle-earth also presents new mechanisms to enhance the game. Faction Dice and Faction Events, used together with the new figures, open up new and exciting strategies and make the War of the Ring (second edition) even more challenging and fun. The second edition of modern classic The War of the Ring expands and upgrades the original game.